Maurizio Sarri admitted Chelsea paid the price for a sluggish start and a lack of killer instinct as Jordan Pickford’s heroics earned Everton a 0-0 draw on Sunday. Sarri’s side recovered from a poor first half performance and laid siege to the Everton goal after the break, but found Pickford unbeatable as the England keeper made a series of fine saves. The stalemate at Stamford Bridge left Chelsea two points behind Liverpool, who beat Fulham earlier on Sunday, with Manchester City having a chance to pull clear of the Blues against Manchester United later in the day. It was a frustrating afternoon for Chelsea, who extended their unbeaten start under Sarri to 18 games in all competitions but couldn’t make their territorial dominance count. “I didn’t like the first 25 minutes. We moved the ball very slow, so it was impossible for us to be dangerous,” Sarri said. “I’m not happy of course. I don’t know why we start slowly. It’s a good question. I don’t think it’s a physical problem. “In the second half we played with more speed and intensity. So maybe it is a mental problem. Frustrated by Chelsea’s failure to turn possession into goals, Sarri said: “Usually yes we are sharp enough, but not in the last three matches. As I said to my players, we created too few goal opportunities in relation to how much we played. “In this moment maybe it is a little problem. Three matches is a very short time. Sarri is the first new manager to avoid defeat in his opening 12 Premier League games, giving him sole possession of a milestone he shared with Nottingham Forest’s Frank Clark going into this weekend. “I’m very proud of it. I have to say thank you to my players and staff. Of course I prefer three points than the record,” Sarri said. It didn’t help that, despite scoring twice against Crystal Palace last weekend, Alvaro Morata once again struggled to impose himself. Chelsea finally threatened when Marco Alonso’s free-kick flashed just wide. It took 39 minutes for Sarri’s team to muster a shot on target when Alonso met Willian’s high free-kick with a thunderous volley that Pickford repelled. Bernard was involved in a flare-up just before half-time, moving his head aggressively towards Antonio Rudiger after the Chelsea defender confronted him over his failed attempt to win a free-kick. Rudiger appeared to make the most of minimal contact from Bernard and both players were booked by referee Kevin Friend. That was one of several flash-points in a bruising clash that saw Chelsea’s Jorginho booked for crunching into Gylfi Sigurdsson. “It was a tough match. I hope we don’t lose Sigurdsson after the tackle from Jorginho,” Everton boss Marco Silva said. Eden Hazard tried to spark Chelsea into life immediately after the interval, drilling over an inviting cross that Morata prodded goalwards, only for Pickford to make an excellent stop. When Hazard slipped a superb pass through to Willian, it seemed certain the Brazilian would break the deadlock, but he sent his shot inches wide. Making his second start after returning from a back injury, Hazard was far more vibrant in the second half and his stinging drive forced Pickford into a sprawling save. Running at the Everton defence with abandon, Hazard went close again when his shot deflected off Yerry Mina, forcing Pickford to tip over at full stretch. 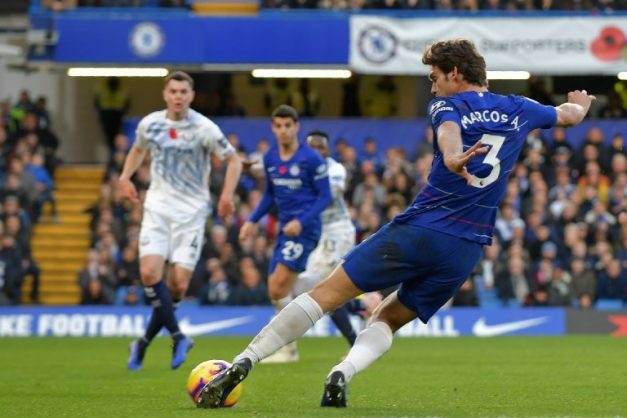 Only the woodwork denied Chelsea when Alonso’s low shot hit the far post, while Hazard clipped a shot narrowly wide as the Blues’ frustration mounted.